The artwork Chajara was created as part of the event, Plastic Interventions, at the Marina Alta in Spain in 2003. Younes Rahmoun chose three carob trees that interested him, notably because they seemed to have just emerged from the earth and gave an impression of youthfulness. 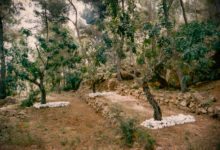 Intervening with materials found on site, the artist surrounded these trees with small stones painted with lime and emphasized their aesthetic side by covering them with shroud fabric.